Who can help Kiki Cuckoo build a nest for her eggs? Be careful! As soon as a few suitable twigs are on the nest you must gently rest a cuckoo egg on top; the fragile eggs may tumble down a half-built nest! It takes finesse and a little luck to be the first to place all of your wooden eggs safely in the nest. But that's not all; the winner will be the one who can then securely place the wooden Kiki Cuckoo bird on top of the nest of twigs! 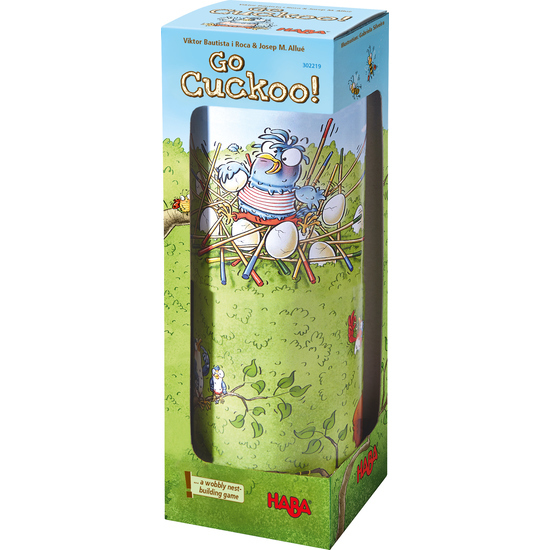 Contents: 1 nesting site, 1 Kiki Cuckoo, 70 wooden sticks, 20 cuckoo eggs, 1 game instructions sheet.